Così fan tutte at UD! On May 11, WVUD’s Campus Voices previewed the upcoming UD production of Mozart’s Così fan tutte. Co-hosts Mandorichard and Rachel Silva visited the Roselle Center for the Arts to interview Dr. Blake Smith and members of the cast and crew of the University of Delaware’s Opera Theatre (UDOT). This semester, UDOT will be presenting a rendition of Mozart’s comedy: Così Fan Tutte. We had a blast speaking with members of the company, including undergraduates, graduate students, UD alumni, and faculty. This episode provides a backstage glimpse into what it takes to put on a UDOT production–imagine finding the director doing carpentry on the loading dock! Learn what really happens in the green room before a rehearsal! Hear how Mozart’s 18th Century opera has been transplanted to 20th Century Brooklyn! UDOT’s Così Fan Tutte will be performed Friday, May 12th at 8:00 p.m. and Sunday, May 14th at 3:00 pm at the Roselle Center for the Arts. Don’t miss it. Thanks to all the cast members, musicians, and crew for welcoming us to their rehearsal on May 8. Così Fan Tutte, recorded on May 8, 2017. First aired on May 11, 2017. Dr. Blake Smith is an associate professor of voice and opera, which has served him well as director of UD’s Opera Theatre. Blake received his Bachelor of Music from the University of Texas and both his Master and Doctor of Musical Arts from Texas Tech University. Before coming to the Univesity of Delaware, Blake performed at prestigious theatres across the country, making him one of the most prominent staff members at UD. Hear our complete interview with Director Blake Smith. The tenors in the chorus talk about their roles. Hear Shoshona Lieberman talk about the green hat she made for Despina’s costume. Meet freshman Michael Willis, understudy for the role of Don Alfonso. On this epi sode of The Music Room, Mandorichard sits down with cast members Kameron Ghanavati (Werther) and Kaitlyn Tierney (Charlotte) and assistant director Cara Ferro of the UD Opera Theatre’s spring production, Werther. French composer Jules Massenet’s Werther is a heart-breaking opera based on the semi-autobiographical German epistolary novel The Sorrows of Young Werther by Johann Wolfgang von Goethe. “The way he marries the music with the text is unbelievable,” says Ghanavati of Massenet. The opera was completed in 1887 and premiered at the Imperial Theatre Hofoper in Vienna in 1892. With guidance from director D. Blake Smith and music director James Allen Anderson, the UD Opera Theater will bring this 19th Century Romantic production to life on the Thompson Theatre stage at the Roselle Center for the Arts. 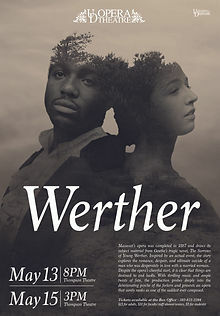 Werther will be performed on Friday, May 13 at 8:00 p.m., and Sunday, May 15 at 3:00 p.m. Tickets are available at the CFA/REP Box Office. For more information about UD Opera Theatre, udoperatheatre.com. Listen to the interview below to hear commentary from the cast members and previews of the extraordinary music performed in the UD Opera Theatre’s production of Jules Massenet’s Werther. Host: Mandorichard; aired May 10, 2016. Thanks to Director D. Blake Smith, Conductor James Allen, and to our guests–Kameron Ghanavati, Kaitlyn Tierney, Cara Ferro–and to the entire cast, orchestra, and crew of UDOT’s Werther. Fittingly, Ward’s interpretation of “The Crucible” is “anxious from the very downbeat,” says opera director Blake Smith. In a departure from his regular, instrumental writing, Ward wrote an opera whose “angular vocals” are simultaneously disquieting and breathtaking, according to Smith. In addition to featuring some truly beautiful music, this episode offers multiple interviews with “Crucible” cast members, all students or graduates of the University’s Department of Music. If the podcast leaves you wanting more (and we know it will), the UD Opera Theater’s production of “The Crucible” happens Friday, Nov. 13 at 8:00 p.m., and Sunday, Nov. 15 at 3:00 p.m. You can find more information at udoperatheatre.com. Follow the link below to hear the singing, the student orchestra conducted by James Allen Anderson, and the commentary, all recorded during a rehearsal on Friday, Nov. 6, 2015. Host: Mandorichard; recorded Nov. 6, 2015; aired Nov. 10, 2015. We were not able to include all the interviews in the WVUD radio program. 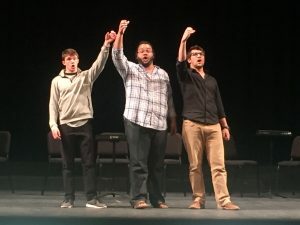 Below are five extra interview segments that contain interesting insights into 20th Century opera, the UD Opera Theatre production of “The Crucible,” and the Music Department’s vocal music program.